I bought a Dr. Suess book panel probably five or six years ago in a clearance bin and wondered if that would work for a One Block Wonder. Wow, did it ever! Just pure fun to work on this one. I got so many hexies out of the panel that I could make three baby quilts. They've been sitting in a drawer for awhile waiting for the right baby to come along to gift them to. The first one is finished and going to baby Nora. I thought I would end up discarding some of the hexagons as I figured they would not be very interesting, but amazingly even the ones with the white from the edges worked out very well! I used every hexie. I separated them into three piles by colour. This one used the blue and yellow ones. The second one is set with green and the third one will be orange/red. I will post those when they are finished. I had the yellow and blue top together and was adding the solid yellow sashings and borders and the quilt was hanging on my design wall. I happened to be sitting in a chair on the opposite side of the room and contemplating why I put the hexies in that particular order and wondering what ever I was thinking when I designed it! Just before I sewed the panels onto the main quilt, I realized that I had turned it upside down! No wonder it looked so out of balance...all the dark colours were on the top and the light on the bottom. Fortunately I was able to turn it around yet, but the panels ended up on the other side. Pictures of the two versions below 😀. The original panel (I had purchased 7 so I could use the original in the quilts somewhere). This is the layout I was contemplating from across the room! It just felt really unbalanced. I had this piece of Dr. Suess fabric in my stash which was perfect for the backing. 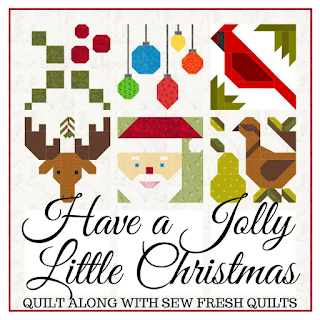 I'm linking up to Julie's blog, The Crafty Quilter with my second finish for the month of January! Nice quilt. Yes, it looks better once you turned it around. Love the results of this Jacqui. So playful and always different.